The meteoric rise of Mookie Betts finally landed him in Boston, as the Red Sox called up their top prospect on Saturday. He made his major league debut last night, going 1 for 3 with a walk, while appearing in right field, which was just his third game there as a professional. John Tomase of the Boston Herald first broke the news of the call-up. 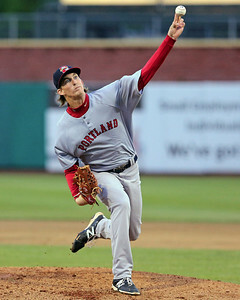 After tossing 27 2/3 innings with a 1.63 ERA in June, Henry Owens (pictured) appears ready to be tested in Pawtucket. Ian Cundall featured Owens in his most recent Scouting Scratch, offering an in-depth look into how Owens has dominated the Eastern League. Owens's walk numbers have gone from 3.77 per nine innings in April, to 5.05 in May, to 2.28 in June. It would not be surprising to see Owens promoted in the next few weeks. Owens and Betts were both named to the All-Star Futures Game last week, though the recent promotion of Betts means he may not be appearing in the game. If Betts is in the major leagues when the game is played on July 13, Blake Swihart seems like a logical fit to replace him. Cundall was not the only SoxProspects.com scout hitting the fields in June, as Northeast Scout Chaz Fiorino offered his notes from Pawtucket in The Write-Up. The article has notes on Betts, Anthony Ranaudo, Travis Shaw, and Christian Vazquez. Ben Badler of Baseball America released the Top 30 international prospects eligible for the July 2 signing period, and the Red Sox are linked to some of the top talent. The top pitcher on the market, Anderson Espinoza, has been linked to Boston for several weeks, and he should sign for around $2 million. Badler also notes that Christopher Acosta, the third ranked pitcher on his list, is likely to sign with the Red Sox. The Red Sox officially signed several draft picks this week, though most of them had been previously reported. The most significant new signing was fourth-rounder Kevin McAvoy, who was assigned to Lowell. Sam Travis is the only top pick to appear in game action so far, and he has gotten off to a solid start for the Spinners, hitting .273 with two home runs in 11 games, though he is still searching for his first walk. After Betts was promoted to Pawtucket, there was a hole at second base in Portland that needed to be filled. Sean Coyle stepped in and has not only matched Betts's production, but he may be exceeding it. With one game to go in June, Coyle is hitting .352/.457/.659 this month, with six home runs and five stolen bases. Still just 22, Coyle has risen to number 14 in the SoxProspects.com rankings, up from number 23 to start the season. Coyle's double play partner, Deven Marrero (pictured), has been no slouch himself, batting .368/.441/.552 in June, with 13 walks and only 10 strikeouts. Marrero has been inconsistent this year, starting off hot over the first three weeks, then cooling down over the next month, but he has been on fire ever since. In all, he is sporting a .293/.374/.437 line over 263 at-bats, while playing superb defense at shortstop. While the news broke last week that Rafael Devers was going to be promoted to the Gulf Coast League, the 17-year-old is still in the Dominican Republic. While the Red Sox likely want to promote Devers, who has an OPS near 1.000 in the Dominican Summer League, there are often issues with overseas promotions. Look for this situation to be resolved in the coming weeks, and for Devers to be playing in Fort Myers. It was an emotional night in Lowell on Wednesday, as the Spinners retired Ryan Westmoreland's number as part of "Westmoreland Night". Westmoreland, who played for the Spinners in 2009 when he hit .296/.401/.484, was one of the best players to ever put on a Spinners uniform, and Lowell did a great job of honoring him. Joe McDonald of ESPNBoston.com posted a great recap of the night, with some quotes which will bring you to tears.